Macrame chandelier with 100% iron powder coated frame and cotton macrame. Product Name: Chandelier	Model No. 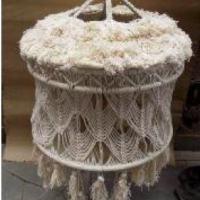 : 249-3	Details: Lamp Dimensions: D44xH63cm + chain (40cm long). Lamp Body Material: Iron. Lamp Body Finish: Matt black paint coating. Input Voltage: 110V – 265V. Bulb: 3x60W max E14 incandescence bulb (Not included). Packing: 1pc/CTN. Illuminated Area: 10 – 15 square meters. Suitable for: Living room, dining room, bed room etc. Product Name: Chandelier	Model No. 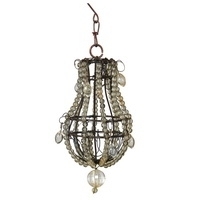 : 249-6	Details: Lamp Dimensions: D70xH80cm + chain (50cm long). Lamp Body Material: Iron. Lamp Body Finish: Matt Black Paint Coating. Input Voltage: AC 110V – 265V. Bulb: 6x60W max E14 Incandescence Bulb (Not included). Packing: 1pc/CTN. Illuminated Area: 15 – 20 square meters. 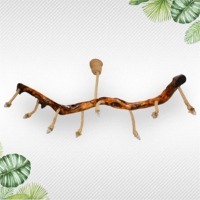 Suitable for: Living room, dining room, bed room etc. Short on time? Let chandelier sellers contact you. Product Name: Chandelier	Model No. : 256-3	Details: Lamp Dimensions: D45xH58cm + chain (40cm long). Lamp Body Material: Iron. Shade Material: Fabric. Lamp Body Finish: Antique brass paint coating. Input Voltage: AC 110V – 265V. Bulb: 3x60W max E14 LED or CFL bulb (Not included). Packing: 1pc/CTN. Illuminated Area: 10 – 15 square meters. Suitable for: Living room, dining room, bed room etc. Product Name: Chandelier	Model No. : 256/6+3	Details: Lamp Dimensions: D80xH83cm + chain (60cm long). Lamp Material: Iron. Shade Material: Fabric. Lamp Body Finish: Antique brass paint coating. Input Voltage: AC 110V – 265V. Bulb: 9x60W max E14 LED or CFL bulb (Not included). Packing: 1pc/CTN. Illuminated Area: 40 – 50 square meters. Suitable for: Living room, dining room, bed room etc. Size : W950 X H870 Lamp : E14 X 7. Changzhou Runda Illumination Equipment Co., Ltd. Presented is a crystal chandelier that is arranged in the shape of a saucer to boost uniqueness. Small crystal beads are in a good concert with crystal prisms to flaunt an artistic touch. This brilliant crystal chandelier is ideal to add elegance and glamor to a modern house. Material: crystal. Available in various styles. 1.K9 crystal chinese grade a 2.The hardware is zinc alloy. 3.Minimum order is 15pcs 4.Delivery time about 20 days after receive deposite. Lamp size:d570*h640mm. 1) Crystal chandelier. 2) Chinese crystal and Egyptian crystal available. 3) E14 X 10. 4) Packed in carton.